Call it the house that John built. John Brennan got to McMaster and started building an academic program. Then he created a research institute centred around that program. And now he’s helping to run a centre that takes that research and develops it for widespread use. 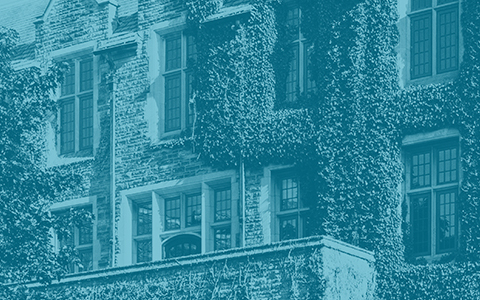 The Canada Research Chair in Bioanalytical Chemistry started out at McMaster as an assistant professor of chemistry in 1998. As Brennan put together the school’s chemical biology program, he made headlines for his research on bioactive paper – a paper-based sensor that reacts to a sample and shows a result right away, the way a pregnancy test does. In 2010, Brennan was awarded more than $14 million from the government to start the state-of-the-art McMaster Biointerfaces Institute, where his focus is on point-of-care diagnostic technology – tests that work like home pregnancy or glucose tests and can be used wherever a patient is, rather than in a lab. Only, these tests will detect C Difficile or Hepatitis B. Now Brennan is managing director of the brand-new Fraunhofer Project Centre for Biomedical Engineering and Advanced Manufacturing (BEAM), which opens March 7. BEAM aims to commercialize new technologies, moving research like Brennan’s out of the lab and into communities. Any interaction between chemistry and biological materials is fair game at the Biointerfaces Institute. One of Brennan’s colleagues is leading research into ophthalmic applications of biomaterials, developing ways to make it easier and more efficient to administer eye medications. Another is exploring cell therapy. Brennan’s focus was originally on detecting environmental toxins, like pesticides. But now his research is primarily for clinical applications: Developing point-of-care diagnostics that will generate simple-to-read outputs for things that currently require lab tests, like testing for infectious diseases or HIV. Brennan’s colleague wanted a test where that sample would instead interact with the paper and give a simple result – one line for one outcome, two for the opposite. But even when researchers can deliver results in the lab, it’s a long road to developing their work to make it easily accessible. They still require clinical validation and trials, a way to scale up and automate production, and an industry partner. “A million diagnostic tests died on the lab bench because the researcher didn’t know how to get to Step 2: Clinical validation,” Brennan says. The centre will take researchers’ work and collaborate with clinicians for validation and trials. Working with researchers and industry partners to automate the manufacturing process is another key priority for BEAM, which is a joint venture between the university and German institute Fraunhofer IZI, a world leader in manufacturing cell therapies. But all those therapies are made manually, Brennan says. “There are 20 steps to create a single dose, and every one of them is done manually by a human being,” making it extremely expensive for the manufacturer and, ultimately, the patient. Call it the house that John built. John Brennan got to McMaster and started building an academic program. Then he created a research institute centred around that program. And now he's helping to run a centre that takes that research and develops it for widespread use. The Canada Research Chair in Bioanalytical Chemistry started out at McMaster as an assistant professor of chemistry in 1998. As Brennan put together the school's chemical biology program, he made headlines for his research on bioactive paper - a paper-based sensor that reacts to a sample and shows a result right away, the way a pregnancy test does. 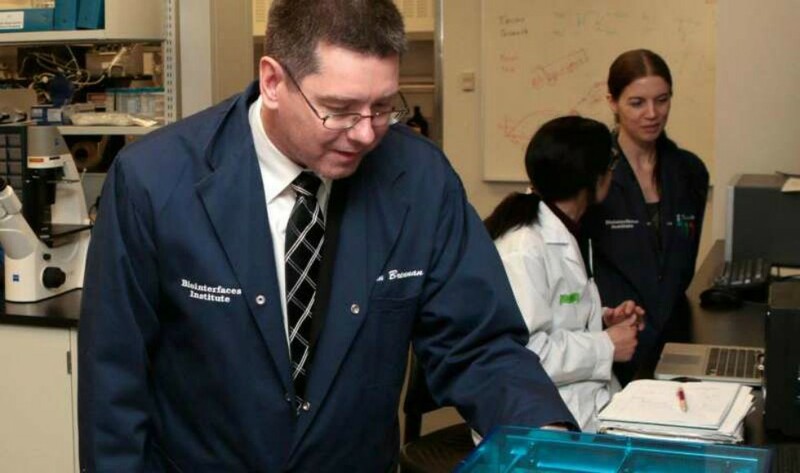 In 2010, Brennan was awarded more than $14 million from the government to start the state-of-the-art McMaster Biointerfaces Institute, where his focus is on <a href="https://www.thespec.com/news-story/5546307-mcmaster-bio-ink-detects-deadly-bacteria-with-a-touch/">point-of-care diagnostic technology</a> - tests that work like home pregnancy or glucose tests and can be used wherever a patient is, rather than in a lab. Only, these tests will detect C Difficile or Hepatitis B. Now Brennan is managing director of the brand-new Fraunhofer Project Centre for Biomedical Engineering and Advanced Manufacturing (BEAM), which opens March 7. BEAM aims to commercialize new technologies, moving research like Brennan's out of the lab and into communities. Any interaction between chemistry and biological materials is fair game at the Biointerfaces Institute. One of Brennan's colleagues is leading research into <a href="https://brighterworld.mcmaster.ca/articles/special-delivery/">ophthalmic applications of biomaterials</a>, developing ways to make it easier and more efficient to administer eye medications. Another is exploring <a href="https://brighterworld.mcmaster.ca/articles/the-best-weapon-in-the-war-on-cancer-might-already-be-in-your-body/">cell therapy</a>. Brennan's focus was originally on detecting environmental toxins, like pesticides. But now his research is primarily for clinical applications: Developing point-of-care diagnostics that will generate simple-to-read outputs for things that currently require lab tests, like testing for infectious diseases or HIV. [embed]https://www.youtube.com/watch?v=BKsaPUsn15I[/embed] A few years ago, a colleague from the Faculty of Health Sciences approached Brennan to develop a simple test to differentiate between an autoimmune response - like an allergic reaction - and an infection. "There is a way to do it in the lab - you manually count the types of cells in a sample," Brennan says, "but it's a very, very hard test to do." Brennan's colleague wanted a test where that sample would instead interact with the paper and give a simple result - one line for one outcome, two for the opposite. But even when researchers can deliver results in the lab, it's a long road to developing their work to make it easily accessible. They still require clinical validation and trials, a way to scale up and automate production, and an industry partner. "A million diagnostic tests died on the lab bench because the researcher didn't know how to get to Step 2: Clinical validation," Brennan says. That's where BEAM comes in. "In order to move research forward, it is necessary to cross the ‘valley of death’ to, ultimately, create a clinically validated and easily manufacturable diagnostic test that is simple to use by the customer." The centre will take researchers' work and collaborate with clinicians for validation and trials. Working with researchers and industry partners to automate the manufacturing process is another key priority for BEAM, which is a joint venture between the university and German institute Fraunhofer IZI, a world leader in manufacturing cell therapies. But all those therapies are made manually, Brennan says. "There are 20 steps to create a single dose, and every one of them is done manually by a human being," making it extremely expensive for the manufacturer and, ultimately, the patient. "It's like building a car by hand," he says. "The only way to make it economically viable - and reliable - is to automate manufacturing." Once BEAM and its industry partners set up a system to scale up and manufacture new technologies, Brennan says, "all a company has to do is take what we created and put it in a box for sale."